12.5" RCOS @ ~f/9 (2880 mm fl) 0.643 arcsec / pixel. Shown resampled to 1.90 arcsec / pixel. CCDStack to register, normalize, data reject, combine and luminance sharpen. PhotoShop for the color combine. 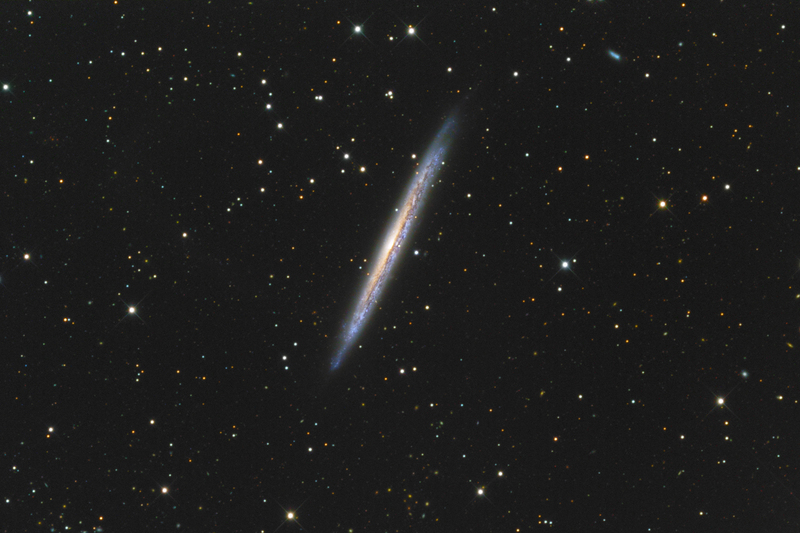 NGC 5907, also known as the Splinter or Knife Edge Galaxy. is located in the constellation Draco at a distance of about 40 million light-years. Grand tidal streams of stars, left from an ancient orbiting satellite galaxy surround NGC 5907. I was not able to image the streams, maybe 30 minutes sub exposures will to the job.